I used to love going grocery shopping this time of year in Tokyo. Many days were sunny and perfectly warm. The plum blossoms had just left us in time for Cherry Blossoms to begin peaking through their buds. There was a little stone path just behind the shopping area that was lined with trees and outlined by a small creek that was drained of its water during the winter months. By now, the water is probably gurgling once again. In a few weeks, soft pink petals from cherry blossom trees will be floating on its surface. Walking into the grocery store was sometimes an overwhelming experience, even after almost 4 years of walking through the doors. Somehow I found my peace in the midst of the crowd and the music and the overhead sale announcements. One thing I loved was how the store was always decked out to feature the freshest seasonal ingredients. Of course in the spring it's all about Sakura. In the winter, hot pot ingredients are showcased. During the summer, bottles of premixed dipping sauce for cold soba and somen are abundant. My grocery bags were almost always filled with a completely different selection each and every week. But a few items always made their way into my basket. One thing in particular was a delicious fruit and nut bread. It was packages in small, clear plastic bags with just 4 or 5 slices. This was perfect since I was the only one in the house eating it. In the mornings, I would toast one slice of the bread and slather it with peanut butter. That was my breakfast and it was all I needed. 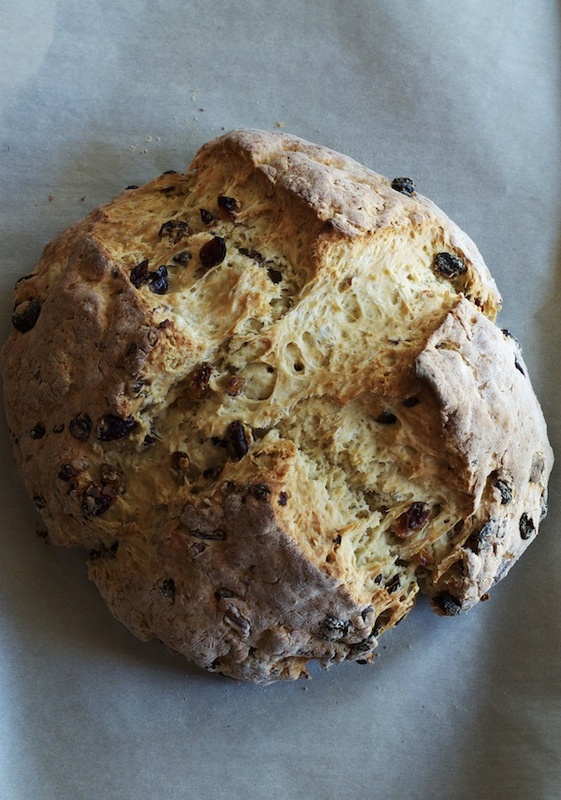 I haven't found anything like that bread here, but this Irish Soda Bread comes pretty close. It is studded with sweet golden raisins, tart dried cranberries, and buttery pecans. It is perfect with a bit of butter and a sprinkle of sea salt. Is is strange that something so Irish brings me back to Tokyo? I don't know. Maybe it is a little strange. But I'm always thankful for these little memories that, at the time, seemed "normal" but now are near and dear to my heart. Preheat the oven to 375 degrees Fahrenheit and line a baking sheet with parchment. In the bowl of an electric mixer fitted with the paddle attachment, combine the flour, sugar, baking soda and salt. Mix on low speed for about 30 seconds to combine the ingredients. Add the butter and mix on low speed until combined with the flour, about 45 seconds-1 minute. In a small bowl, whisk the buttermilk with the egg and grapefruit zest. With the mixer running on low speed, add the buttermilk mixture and mix just until the dry ingredients are moistened. Toss the raisins, cranberries and pecans with 1 tablespoon of flour (this helps them stay in place as the bread bakes rather than sinking to the bottom of the loaf). Add the dried fruit and pecans to the dough and mix until just incorporated. Turn the dough onto a well-floured surface and knead a couple of times to shape it into a round. Place the dough on a parchment lined baking sheet and, using a sharp knife, cut an 'X' into the top about 1/2 inch deep. Bake for 45-55 minutes or until a skewer inserted into the center comes out clean. Allow the bread to cool on a cooling rack. This bread recipe is slightly adapted from Ina Garten's (found here: http://www.foodnetwork.com/recipes/ina-garten/irish-soda-bread-recipe.html). Mar 11 Set the Table's 1st Birthday!